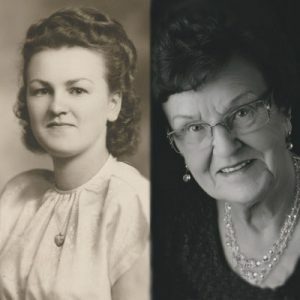 After a long and full life, Mrs. Ruth Kristensen passed away at her home on March 29th, 2019. Born in Poland, Ruth came to Canada at the age of three with her parents, where they settled in Trochu, AB. In adulthood, Ruth moved to Calgary to work, where she met her husband Gunnar (Kris) Kristensen. Together they retired in 1989 to Kelowna, BC where they enjoyed life to the fullest. Her enthusiasm and energy were evident in all she did. She most enjoyed the time spent with family and friends singing, painting, working in her garden or playing a simple game of bingo. She was predeceased by her parents, Lydia and Ludwig Henkel, her husband, Gunnar (Kris) Kristensen, her brother Edward, and his wife, Phillppina. She leaves to mourn her passing, her son, Douglas, Tina, and granddaughter Rebecca, brothers Charles (Edna), and Erwin (Donna) and numerous nieces and nephews. The service for KRISTENSEN (nee Henkel), Mrs. Ruth is scheduled for Thursday, April 4 at 1:00 pm . Below you will find the map for the service location and the contact information should you have any questions. Our condolences and our prayers go out to you. Doug, Tina, and Rebecca, our heartfelt condolences and sympathy for your loss. Our support and prayers to you during this time. Ruth was an inspiration in our Garden Club. So sorry to learn of her passing.